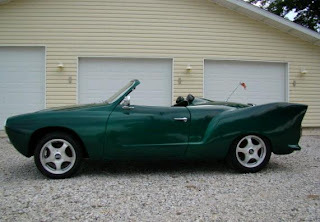 1962 Karmann Ghia - I... I... I... I... I don't know what to write about this car. This is truly awful. This is truly amazing. This thing is so bizarre. This thing is so well done. This started life as a Karmann Ghia hardtop. The top is gone. It has fins from a 1950s Plymouth. The hood scoop is off a '50s T-bird. The back bumper from a Triumph Spitfire.There are Pontiac parts, more T-bird parts, Ford truck parts and even some Harley Davidson bits on this car. It has no side windows or top. It has imitation Leopard skin upholstery. I can't think of any reason why I'd want to own this car. I'd love to meet the guy who built it, though. It looks so well done. What was his thought process? How much time did it take to create? Most of all, why? Located in Lawrenceville, IL, click here to see the eBay listing. A friend sent me this link. She just thought it was amusing to see a rap video about a Volvo station wagon. I do too... It's a pretty catchy tune and after watching the video last night, I've found myself walking around with the chorus stuck in my head. As usual, if you receive Just a Car Geek via e-mail, you'll need to click here to see the video. My favorite line? "Yo the A/C vent knobs look like some Oreos". "1981 Chevrolet Fiat Spider" - Nothing subtle about this car. 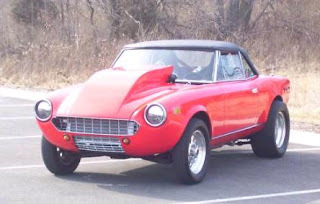 This is a Fiat 124 Spider with a built Chevy 350 V8 in it. Like the Karmann Ghia above, the engineering and amount of work done to this car appears to be incredible. Like the Karmann Ghia above, the big question is, why? "lebanese unique collector exposed 1984 german motorshow" - I have absolutely no idea what this is and the ad is no help whatsoever. Located in France, I think, click here to see the eBay listing. Looks Fiat X1/9 based. 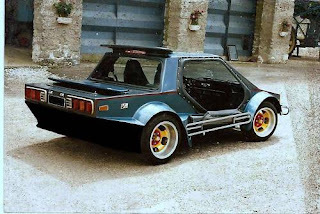 And in 1984, it was a common base for prototypes.